The narrow width but longer length gives this Country House an 'old timey' look. Upstairs the very long, dormitory type bedroom with its many closets has a sitting area in front of a window seat. Copyright © 1998-2015 Natalie Howard. All rights reserved. 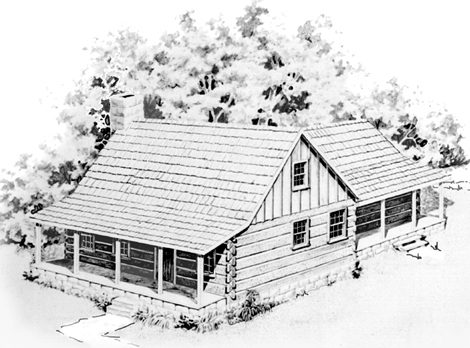 While Log Plan L-1735 is narrow, its length gives the house an 'old timey' look. 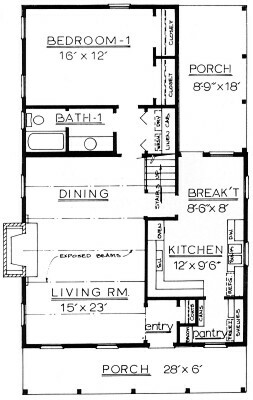 Notice the walk-in pantry off the kitchen that can hold an upright freezer or an extra refrigerator for holiday menus. The conveniently designed kitchen has built-in ovens and separate cook top. Its shape limits the walk-thru foot traffic. The breakfast area adjoins the wide side porch and the open stairs to the second level. Note the washer and dryer in the Hall Utility Closet. 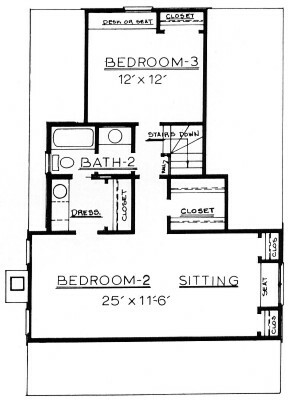 Upstairs, the very long, dormitory type bedroom with ample closets has a sitting area in front of a window seat. There is enough room for two standard size beds in this long bedroom. The compartmented bath offers two separate vanities for quick cleanups. A large closet with sloped floor is located over the stairway. Of course, the main feature is the long, wide living room with its center fireplace and open stair rail. The shed front porch is wide enough to accommodate your country rockers. Chinked, pine 6x12 Dovetail Logs are used in this charming Log Plan, L-1735, although you can substitute another Log type. When purchasing the basic Log Plan L-1735, the alternate plan, F-1735-A, is included. This alternate plan places a large, front dormer over the country front porch. 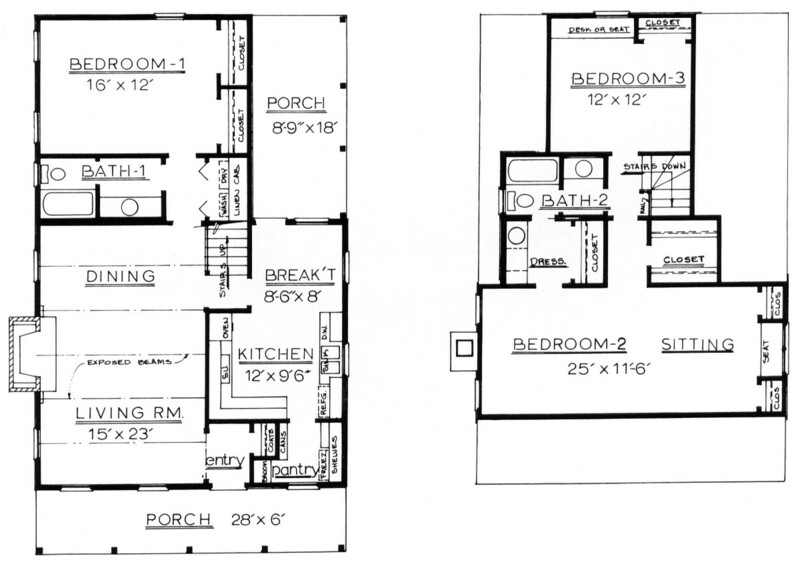 The master bathroom is enlarged with two vanity cabinets and a separated garden tub area that has an overhead shower. French doors open onto the covered, side porch. An extra powder bath is also provided. Copyright © 1998-2017 Natalie Howard. All rights reserved.